White water rafting on a gentler section of the Rouge River. Perfect for families with children 50 lbs or more. 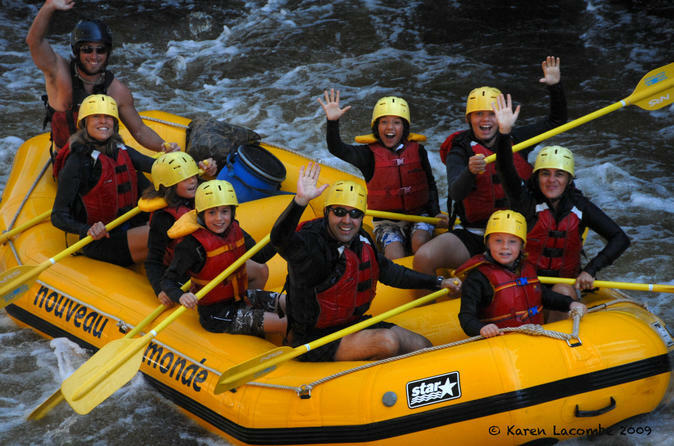 This trip is the perfect summer activity for families with kids or anyone looking for a fun and easy rafting experience! You will meet at the reception of the base camp at 10:30 a.m. From there, we will take a bus to the quieter section of the river (approx. 45 min)where you will meet our professional rafting guides. After a short safety briefing you take off down the river! You will raft on the Rouge River with rapids up to class 3, with stops for swimming, bodysurfing. A riverside picnic lunch of sandwiches will be served mid way, while you enjoy the scenery, swirling currents and expansive sandy beaches. After your river descent (approx 3 hours), you will go back to base camp where you can take advantage of 'après-rafting' activities (pool, hot tub, snack bar, showers) before you head back home.